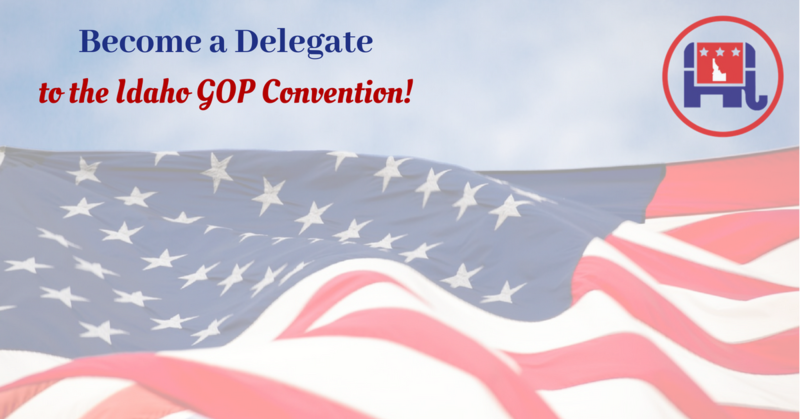 Home » News » Act This Week to be a Delegate to the Idaho Republican Convention! Starting this Wednesday, May 23, through Saturday, May 26, local Republican Parties across Idaho will hold meetings to select delegates and alternates to the Idaho Republican State Convention in Pocatello in June. If you’re a registered Republican and would like to participate in the State Convention, please attend your local meeting and apply to be a convention delegate or alternate! You can find the full list of County and Legislative District Republican meetings on our website by clicking here. To apply to become a delegate or alternate, just fill out this Delegate Pledge form and bring it with you to your local meeting. As a delegate to the state convention, you’ll vote on the party platform, resolutions, and for State Party officers. Delegates, alternates and guests will hear from an exciting guest speaker we’ll be announcing soon as well as Republican candidates and office-holders, attend workshops and other fun activities while enjoying the company of fellow Republicans from across Idaho. The Idaho Republican Convention takes place June 28-30 in Holt Arena at Idaho State University in Pocatello. For more information on the delegate process, click here. For information on hotels and other accommodations in Pocatello, click here. May 21, 2018 / In News / By Idaho GOP / Comments Off on Act This Week to be a Delegate to the Idaho Republican Convention!